Digga's new generation premium auger drive range is the ultimate in performance, quality and cost effectiveness. Over 30 years of design and development has produced the highest quality range of earth drills on the market today to suit excavators, backhoes and skid steer loaders. 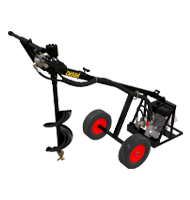 Completely manufactured and assembled by Digga, using only the highest grade materials and strictest quality control. Fitted a with Digga designed Eaton bell motors with intergrated pressure relief valve and input housing. The innovative design allows the gearbox to go down the hole to maximise drilling depth without extentions, eliminating downtime and minimises maintenance, optimising your returns. Backed up with industry leading warranty and European factory backup. Digga planetary auger drives are ideally suited to drilling and augering applications in most ground conditions.